As far as we know, there is no one inside this sculpture. But perhaps we should check: an ancient Buddha statue was recently scanned in the Netherlands and was found to contain a mummified monk. 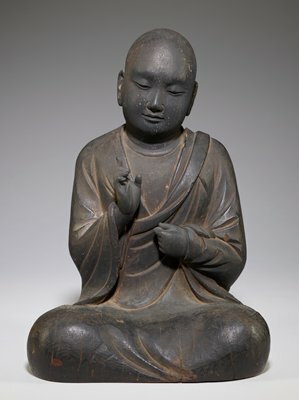 The mummy is sitting in the lotus position, on a roll of cloth inscribed with Chinese characters spelling his name: Liuquan, meaning Six Perfections—a reference to the six perfect virtues that someone seeking buddhahood needed to practice. But this monk might have gone a step further, to self-mummification, eating nothing but nuts and seeds, bark and roots, and finally a poisonous tea. He would have spent his last days as a kind of living skeleton, sealed inside a stone tomb barely bigger than his body, breathing through a tube. He would have run a bell every day that he was alive, and when he rang no more the tube was removed and he was sealed up.